The City Council Sul has honored an American Redemptorist. 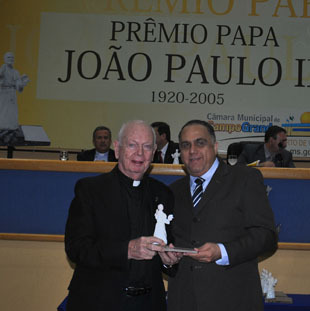 Father John Hennessy, a member of the Baltimore Province serving in the Campo Grande Province in Brazil, received the John Paul II Medal of Honor from the Board of Aldermen in Campo Grande, Brazil May 16. Father John, 84, was born in Boston. He professed vows as a Redemptorist in 1948 and was ordained to the priesthood on June 21, 1953. He was sent to Brazil by the Baltimore Province almost 60 years ago. In 1987, he went back briefly to the U.S. serving as rector of the Basilica of Our Lady of Perpetual Help (Mission Church) in Boston and then returned to Brazil in 2001. He ministers full-time in the Shrine of Our Lady of Perpetual Help in Campo Grande. He offers assistance in 17 novenas every Wednesday at the Shrine, and celebrates two Masses on Sunday and accompanies several pastoral groups during the week. Father Dirson Gonçalves, rector of the Redemptorist community at the Shrine, considers it a wonderful experience to have Fr. 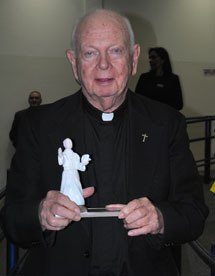 John in the Redemptorist Community and the Shrine in Campo Grande. He is always available for any kind of ministry. Fr. Dirson echoes the sentiments of all when he asserts that Fr. John Hennessy remains a great blessing for us in Campo Grande. Father Joaquim Parron, CSsR, the Provincial of the Campo Grande Province, believes that Father John is a great example of Religious Life for the young in Brazil and prays that he can stay many more years with us.